In the rural Bariadi District of Tanzania, health information and care are particularly difficult to access. This puts mothers, children and families at risk of avoidable diseases and conditions such as malaria, pregnancy complications and malnutrition. To increase access to information and help individuals recognize warning signs of serious health conditions, WellShare International, in partnership with Health eVillages, has provided health workers in the community and local clinic with tablet computers. The tablets are loaded with a wide range of health content – including videos and books — on prescription drugs and symptoms of diseases and conditions. With support and guidance from community and clinical health workers, Tanzanians will be better informed on how to improve and maintain their health. Community organizing and outreach: Through local events, community health workers can build relationships with women who are in need of health information and care. Training of health workers: Ten trained clinical health workers will educate 30 WellShare community health workers who will work with women living in local villages. 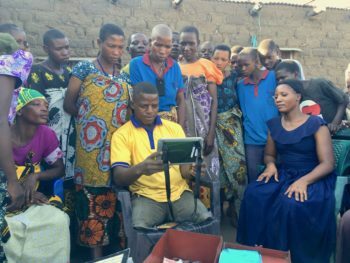 Increased access to health information and care in villages: Clinical health workers will use the tablets to help women understand preventive health care and triage conditions that need clinical expertise. Reduced risk of health conditions and diseases: With increased access to health information, mothers can learn how to reduce the risk of – or prevent – health crises. When a situation does occur, they will know how to access clinical care. Mentorship: The community health workers will continue to learn from the clinical health workers and understand the care provided at the clinics and hospital to improve or maintain the health of mothers and children.